As the first woman ever appointed principal trumpet in a major American orchestra, Slaughter knows all too well how far point A can be from point B for many aspiring professional women brass musicians. She founded the International Women’s Brass Conference and Monarch Brass to help women brass instrumentalists on their sometimes treacherous journeys in the profession. Slaughter had served as principal trumpet of the St. Louis Symphony for nearly 20 years when a group of student brass musicians she was coaching at a summer music festival unwittingly planted the seed for a women’s brass conference. "There were several women brass musicians in the group, and they kept asking me certain questions about, Did I know certain players," Slaughter said. One was, Did I know Gail Williams in the Chicago symphony? And I said, 'Well, yes, I know of Gail. We’ve never met, and we’ve never talked.' Oh, did I know Marie Speziale in the Cincinnati orchestra? 'Well, yes, I know of Marie, but well, we’ve never talked and we’ve never met.' "
Then, Slaughter said, it occurred to her that the few women brass musicians working in the profession at the time had, for whatever reasons, never reached out to each other. "Then one of the gals said, 'What would happen if we had like a conference or a convention where we all got together?' " Slaughter said. "So they planted that seed, and I kept thinking about it." Slaughter spoke with other professional brass musicians and mailed a survey to 1,500 brass players to determine the breadth of the interest in holding a women’s brass conference. The survey responses were mixed but overwhelmingly supported the idea of the conference. "So I felt like I had a mandate and that it was my job to try to make it come about somehow," Slaughter said. "So that’s where we started." Organized by Slaughter, a professional arts manager and host of volunteers, the first International Women’s Brass Conference was held in 1993 in St. Louis. What Slaughter described as a "pick-up ensemble" of professional women brass musicians performed at the conference. "When we played together in the group, we realized that there was no undercurrent of the feeling of somebody sitting around you or next to you hoping that you’ll fail, hoping that you’ll mess up on the concert," Slaughter said. "Everyone was just the extreme opposite—hoping that you would succeed, hoping that you have the best solo that you play all week. And that creates a whole different climate in which to perform." Participating in the IWBC also gave women brass musicians a chance to ask questions and share ideas that might have felt unsafe to voice with their male colleagues. "At the time, most (orchestra) brass sections, when there was a woman in it, there was only one. So (the IWBC) gave us a chance to get together," Slaughter said. "And things that we could never say to our colleagues, because we were put in situations that if you said something back, you could pay for it later, or you were considered not one of them or something like that. So you just kept your mouth shut. But when you came to our conference, and we would go out afterwards and people could start talking—'What do you do in this situation?' "
Slaughter said the IWBC also presented opportunities for women brass musicians to perform as soloists and chamber musicians, and for men—who have always been invited to attend and participate in the conference—to hear them play. And the conference opened up a forum for male brass instrument teachers to learn about experiences that are unique to their female students and colleagues. "And then one thing your teacher could never talk about was, What do you do if you get pregnant? What does that feel like? And of course most teachers at that time were male, and they had no idea. So people who had had children could share that information. So it became—almost the first conference, and every conference since then for those who come for the first time—a revival meeting, where you could open up and talk about anything, and it wasn’t going to come back and bite you." "A wonderful problem to have"
The women’s brass ensemble that played at the first IWBC became Monarch Brass and has performed under that name, though with different membership, at every IWBC since. 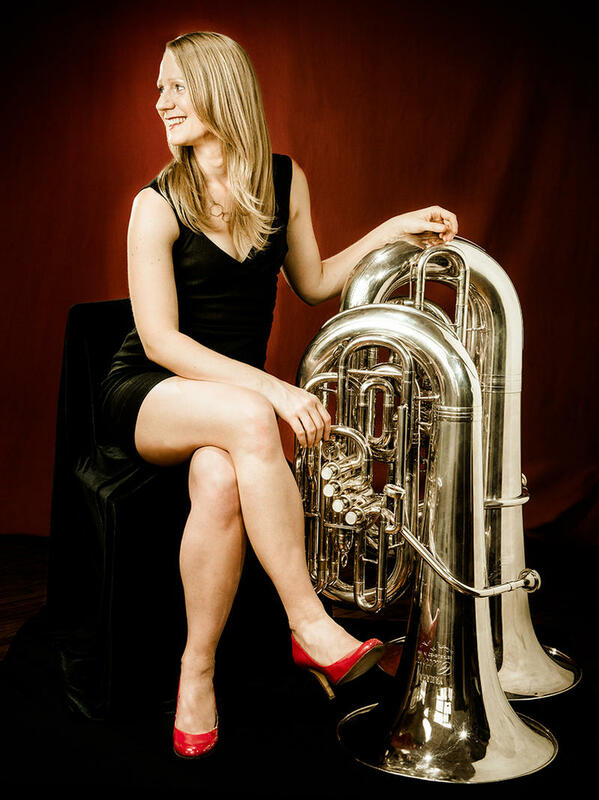 Monarch Brass has brought together musicians who have gone on to form other successful women’s brass ensembles, including Stiletto Brass Quintet and the Athena Brass Band. And while putting together enough women brass musicians to form a sizeable brass ensemble was a challenge for the first several conferences, Slaughter said the increase in the number of high-level women brass musicians over the last three decades has made recruiting players for Monarch Brass much easier. Said Slaughter, "It's a wonderful problem to have, going from, Who am I going to find to play?, to having 20 trumpets to choose from and 15 trombones, and goodness, probably 40 horns and 10 tubas." Throughout the month of March, Classical 101 celebrates National Women’s History Month with Women of Brass, a series exploring all-female brass ensembles and the work of their pioneering founders. It’s 2009, and the Great Recession is draining bank accounts and devouring dreams everywhere. In New York City, four freelance French horn players suddenly find themselves out of work and wondering what to do next.